Calvin Duncan was convicted of first degree murder in New Orleans in 1985. He had been arrested in 1982 for a botched 1981 robbery/murder. The evidence against him was a 15-year-old eyewitness, who made a cross-racial identification of Mr. Duncan nine months after the crime, and some “guilty knowledge” statements Mr. Duncan allegedly gave police when, based on the identification, he was arrested. When then-20-year-old Mr. Duncan arrived at the jail, he realized the lawyers appointed to represent him could not give him the help he needed, so he filed a “Motion for a Law Book,” which the Louisiana Supreme Court ordered the district court to rule on. This began a highly successful, self-taught legal career for Mr. Duncan. 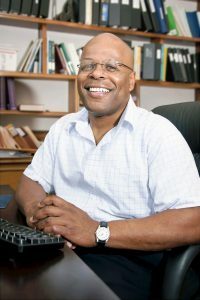 Mr. Duncan was the head lawyer in the “legal programs” department at Angola for nearly two decades and was heavily relied on by prison staff to train and supervise other inmate lawyers and represent the most serious cases assigned to inmate counsel. Mr. Duncan had such success as a jailhouse lawyer that, within hours of his release, people were falling over themselves to repay him for the help he had given them while they were in prison. Mr. Duncan was one of the inspirations for IPNO and provided great assistance to our founder, Emily Bolton, as she prepared to launch the organization. IPNO signed on to his case in 2003 after discovering that the State had withheld significant evidence that showed he had no guilty knowledge of the crime, the perpetrator did not match Mr. Duncan’s physical characteristics and the identification process was completely unreliable. After nearly eight years of fighting for him in state and federal court, IPNO won his release under an agreement with the State where he would be released immediately if he pled guilty to a lesser charge. After 28½ years in prison, Mr. Duncan was ready to get out and was freed on January 7, 2011. He maintains his innocence and has worked every day since his release to help those he left behind.